Moulded base (approximately 26x38 cm). Hundreds and hundreds of little plastic bits. This is more bits than it looks. Construction time: You could probably put it together in three hours but the amount of time required will double with every little helper you have. Age: Officially 8-14 years and it's a choking hazard for those under three (and any dozing grandparents they try to feed Indiana Jones to). That said, young children can play with the completed model and it's my six-year-old who's really got into the building side of things. Comments: I was hoping that Sprog1, who's eight, would enjoy this. Unfortunately, when I brought it out, he merely looked up briefly from his Pokémon game and then went straight back to training his Geodude. I started out making the set myself with three-year-old Sproglette finding me some of the pieces. Sprog2 pretended not to watch but I kept catching him peeking over the top of his DS. Eventually, he came and joined in. First he fought Sproglette to find pieces, then he began putting them together and, finally, he took over. He did most of the second half of the building. I had to help and correct occasionally but he got there. Then he played with it for a couple of hours. It's taking considerably longer to build second time round, though. 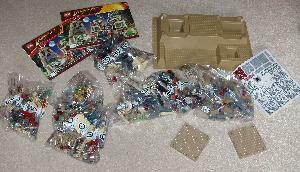 When I first opened the box, it didn't look like the set contained that many bits but this was merely because they were sorted into bags for each section of the model. This was very handy. 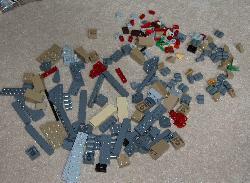 (Although I did panic that I'd lost some pieces until I discovered that there were two Bag Threes.) Now that all the bricks are muddled together, finding the right ones is a task in itself. Helpfully, the instructions make it very clear which selection of pieces is needed for each page, so it's easy to make sure no bits have been missed. The contents of just one bag. There are seven. LEGO is comparatively expensive, but for all that it's just plastic bricks, there's a noticeable difference in the quality of materials and production between LEGO and a Power Rangers set we have that's by a different manufacturer. LEGO have been at this a long time and know what they're doing. The instructions are clear, the stickers don't cross joins in the bricks and the design is modular so it can be put back in the box without too much disassembly. In my day, scenery detail was printed directly onto the bricks so it was disappointing to find that stickers are now being used. They were fiddly to put on neatly but, as stickers go, they're the best I've had to deal with while putting a toy together. Despite sticking firmly once pressed down, they peeled off and repositioned easily during initial application. They also have a clear background, making the finished result look almost as good as printing if care is taken not to trap any loose hair or suchlike underneath. In terms of being a playset, having not seen the new movie yet, some of the model doesn't make much sense. Why does the temple appear to have fold-down solar panels? And what's with the skeletons on a roundabout? I've no idea but it's entertaining making up explanations. (Indiana Jones and the Raiders of the Last Eco Swing Park of Doom!) Doubtless all will become clear once I've seen the film. In the meantime, furling the panels quickly is a good way to catapult little LEGO bad guys across the room. Nintendo DS shown for scale. 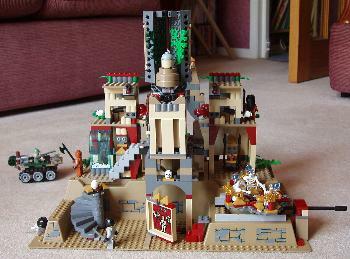 The true longevity of a LEGO set is in the ability to build other things from it. In this case, I'm thinking there's scope for a LEGO Running Man-style game show where contestants risk their lives across a series of deadly traps. I did some experimentation once the kids had gone to bed. (Purely for research purposes, you understand.) It was fun designing a collapsing floor but surprisingly hard work. There are plenty of different, versatile pieces in the set but not many of each type. There are also no traditional 4x2 blocks whatsoever, giving the model a less chunky appearance but making it difficult for novices to create new designs. Unless you're a LEGO ninja, you'll be needing a tub of 'normal' bricks and the cannibalised remains of a LEGO Technic set to really get going. 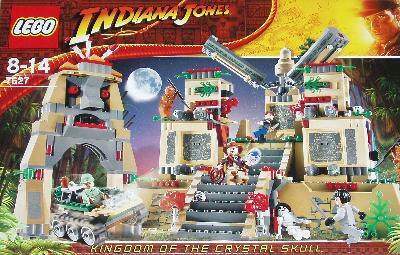 With those, though, you'll have a stop-motion LEGO version of Indiana Jones 5 up on YouTube before you know it. I've had a few bad experiences re-visiting toys of my youth but designing and building stuff out of LEGO is as fun as I remember. Happily, my kids are won over too. Even Sprog1 is starting to get distracted from his virtual menagerie. 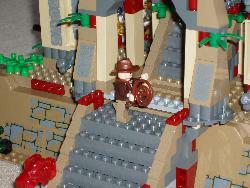 Indiana Jones and LEGO. It's a combination difficult to get wrong. Lots to do and build. High quality production, design and presentation. Vast numbers of tiny, unique pieces. You're bound to find yourself hunting under the sofa at some point. Not based on the original film trilogy. Makes you hanker after a set with a rolling boulder. 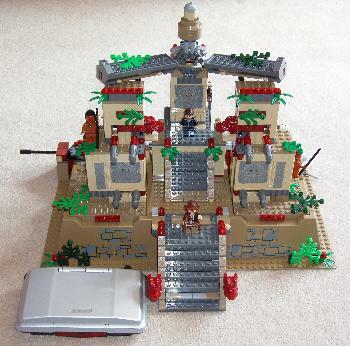 Every time you look at it, you'll get the Indiana Jones theme tune stuck in your head... for hours.